Little girls who love to play with Barbie dolls also love to have lots of clothes for their dolls. It takes a little time, but doesn't require a lot of fabric to make Barbie clothes using Fashion Doll Clothes for 11-1/2" Doll patterns. In fact, most of these clothes can be made of fabric scraps or remnants. This is an ideal gift idea, since you can create fashion clothes in the styles and colors your child prefers. Is her favorite color purple or pink? Make lots of co-ordinating purple and pink outfits! The most memorable gift I received as a child was a Barbie and an overnight suitcase filled to the brim with clothes that no one else had! From the everyday dresses, slacks, tops and shorts my mother sewed to the beautiful evening gowns, it was so special to have unique doll fashions! All my friends enjoyed coming over to play with them. I have several patterns for these dolls, and plan to make them to sell and give as gifts. The original of the pattern shown here is the one Mom used when she made the Barbie clothes she gave to my sister and me. The different fabrics she used, and the clothes she made were all so different, it was like the Barbie had a humongous closet of cothes possibilities. And since many of them coordinated, they could be mixed and matched for an almost endless array of outfits. Does your little girl like to sew or want to learn to sew? Barbie doll clothes patterns and a little fabric are a great incentive to learn to sew. Spend many hours creating memories together while helping her learn to sew using doll patterns. Looking for a Way to Make Some Extra Cash on the Side? 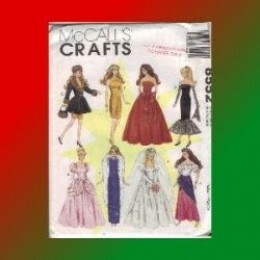 Patterns for fashion dolls are offered by all major pattern companies. They can be made into so many different clothes. For instance, with six different gowns or formal dresses, one peasant style maxi skirt outfit, and a fur trimmed coat dress, the vintage pattern at left will make up a variety of evening styles for Barbie. The pink dress pictured on the pattern would make a great Cinderella gown or if you make it up in yellow, it would be a gorgeous Belle dress. Several years ago, I went to a craft show. One booth was nothing but Barbie clothes. She had everything from everyday outfits to exotic ball gowns, but only one of each. By doing only one of each, she told me, each one was unique, and she never got tired of sewing them. I can see how doing the same gown in the same fabric over and over would be tiring. Of all the vendors at the show, I think she did the most in sales. Barbie was and is a big seller everywhere. Barbie clothes don't take much fabric! Since you don't need much fabric to make fashion doll clothes, fat quarters, originally developed for quilters, are the perfect fabric purchase. Each fat quarter has a selection of color coordinated fabrics that work well together, so you don't even have to think about how to make Barbie's clothes separates coordinate with each other. Would your little girl enjoy unique, one-of-a-kind Barbie clothes for her doll? These are adorable! My girls had been asking me to make barbie clothes. They wanted to buy but I told me that it is expensive! I would love for you to share this over at BLOGGERS SPOTLIGHT PARTY , it is a linky and pin it party in one! Hope to see you there! Hi Cristina! I just added this post to your Bloggers Spotlight Party. Thank you for the invitation! I used to make my Barbie's clothes as a teen too! I didn't sew though, so used a lot of two sided tape and glue guns though!! That is a really creative idea. I never thought of using two sided tape or glue guns to make Barbie clothes. Thank you for pinning my post to your group board!